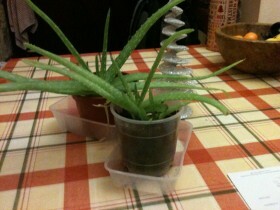 Last week a friend of mine popped in bearing gifts for the Christmas season, in her arms she two plant pots with strange looking spiky plants. My friend Carole said these are for you as I feel you need them as you have 6 grandchildren, she went on to explain the wonderful nature of this plant. Carole has so much knowledge of natural healing and is really in tune with nature, she treats her environment with the greatest respect, she has helped me many times. The plant in question is Aloe Vera, now every summer I spend a fortune on Aloe Vera to put on after sitting or working in the sun but I did not fully understand that it has true healing abilities. Carole told me that if the children have grazes or sores from falling over that this wonderful also she knows as I cook a lot I often have little burns on my arms or hands, all I have to do is cut a leaf from the plant squeeze the clear gel into a sterile tub and then apply it to the wound or graze. I had to put this to the test yesterday not on the children or myself but one of the farm dogs, Pippin, we had returned from a walk over the fields and she kept biting and chewing her foot. On examination of her paw I found a large sore area, bright red and nearly bleeding, Pippin does have a skin condition and sometimes this happens. I went and cut a leaf put the gel into a tub and went and applied it to her paw, I did put quite a lot on so I was unsure what would happen. Pippin stopped biting it almost immediately and this morning when I went to take the dogs out and checked her paw, it was as if it had never been sore it just looked a normal healthy pink and I was amazed. I will nurture my plants and I can see I will be using them often and a huge thank you to Carole for such a useful wonderful gift.